The 2009 Nobel prizes were recently been announced over at http://nobelprize.org. One half of the Physics Prize has gone to Charles K. Tao of Standard Telecommunication Laboratories, Harlow, UK, and the Chinese University of Hong Kong “for groundbreaking achievements concerning the transmission of light in fibers for optical communication”. The other half was jointly awarded to Willard S. Boyle and George E. Smith of Bell Laboratories, USA, “for the invention of an imaging semiconductor circuit – the CCD sensor” which is used in digital cameras. “Today optical fibers make up the circulatory system that nourishes our communication society. 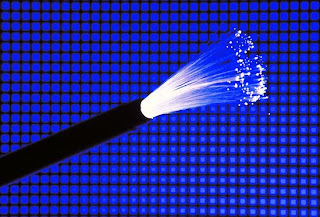 These low-loss glass fibers facilitate global broadband communication such as the Internet. Light flows in thin threads of glass, and it carries almost all of the telephony and data traffic in each and every direction. Text, music, images and video can be transferred around the globe in a split second. Although the hypertext transfer protocols (http) that allows users to view data over the Internet in web browsers (the ‘world wide web’) were developed mainly by Tim Berners-Lee at CERN in Geneva, Switzerland (also home to the Large Hadron Collider), the development and laying of fibre optic cables is what has really enabled this technology to be of use to the world.